With all the spring rain of late, planning summer water sources for your bees is probably not in your radar as a new or returning beekeeper. But as city beekeepers, we need to be pro-active and vigilant in trying to reduce problems associated with normal bee behavior. 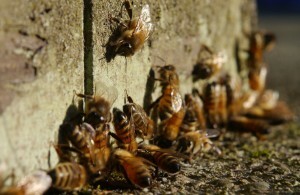 Bees drinking at inappropriate places can cause serious neighbor friction and is a very difficult behavior to change. I’m writing this because during recent sunny weather I had an elevated causeway of bees between hives and an old wooden planter by the house. This is a big problem as suddenly we were walking through bees to get to the backyard. However tolerant my family may be of all things bee, bees in the hair is not acceptable. If I think I have a bee burrowing in my hair I smack first and then determine if it was a bee or the wind. I had failed to replace the bee bowl from dumping in the fall. The bees are clustering and drinking drainage water on the south side of the planter- warm and full of minerals and runoff from cow poop I put in the planter last fall. This is a behavior I had to change, or at least guide to another spot. I reset the ‘water bowl’ with rocks and moss and landing places. Threw some planter dirt in the bottom to make dirty water. Added a bit of bleach to imitate the beloved swimming pool taste and then then gradually started to cover the moist drinking areas from the planter with dirt. The bees will, I hope, stop sharing information to others and shift to the bee bowl. There are many theories about what is the most attractive water source for bees. More importantly to get those water sources out there before problems start. Last year there were backyard fountains and pools that had to be covered with netting to stop bees, swimming pools that became impossible to use, dripping outdoor faucets covered with honey bees and more. Along with swarm control, it is very important to make every possible effort to water your bees in your yard rather than causing distress and anger in non-beekeeper yards.